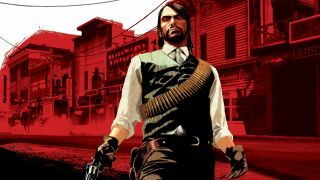 UPDATE: Rockstar has confirmed Red Dead Redemption 2 and it's coming Spring 2018. My love for John Marston is so deep that I could cry. Hell, I genuinely did, when that very upsetting thing happens to him, at the end of RDR. Yet while the charismatic cowboy is likely gone for good, I’m frothing at the mouth for Red Dead Redemption 2. Even more so following the leak of its apparent in-game map. Pity I’m not on board with the idea of a prequel. If that naughtily dribbled out diagram is anything to go by, we’ll be mounting trusty PS4 steeds in an era set long before John’s journey. Look closely at the map and you’ll spot caravan camps and a railroad-free take on RDR’s established Great Plains area, suggesting a more barren, less modernised take on the American frontier. Thematically, this makes sense. After all, the original RDR was focused on the death of the West. Trouble is, Marston’s tale was such an all-encompassing checklist of every major cowboy trope that it’s hard to know where a (presumably 19th century) sequel could go. High noon duels? Done. Stagecoach robberies? Check. Cattle-herding? Been there. Skinning buffalo? Too late, amigo. What else can Red Dead 2 add to the overflowing outlaw stew? Enter the Coen brothers’ laconic, ’80s-set Oscar winner. No Country For Old Men and RDR might be separated by 70 years, but they both represent peak cowboy. No Country lays down a cracking blueprint for Red Dead 2 – the post-modern Western that shows you don’t need swinging saloon doors to capture the genre’s doomed romanticism. Rockstar has already shown its affinity for Cormac McCarthy’s tale of obsession – GTAV has an event in which you can net a cool $25k from a cursed briefcase – so why not go one further and make Red Dead 2 a present-day cowboy caper? Horses AND cars! Modern guns! Dolly Parton on the radio! If that map leak is to be believed, the presence of an area called Heartland Oil Fields may point to a There Will Be Blood-style story. Yet I’d still rather play Marston’s descendant, and make grandpappy proud as a modern-day outlaw.